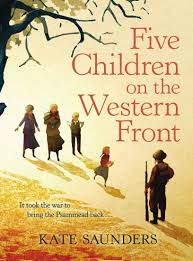 So, those of you with your reading hats on will remember that Tanya Landman won the Carnegie Medal in 2015 for her amazing book Buffalo Soldier (see review) the tale of young black slave who is emancipated and then joins the American army pretending to be a boy. It’s a powerful book about America’s racial problems. The emancipation of slaves by Abraham Lincoln caused a whole load of different problems for the American people in the 1860s. This book is set in England in the 1750s and follows the story of Caleb; a mixed race boy who lives with his father, Joseph Chappell, who is a Punch and Judy showman. Joseph has just finished a show in the small town of Torchester and Caleb is going round collecting any donations. A small boy runs in to Joseph and winds him; a silk purse falls at his feet. After that all hell breaks lose. Joseph is arrested and taken to jail. He is spared a death sentence but it is commuted to seven years hard labour in the colonies (America). Joseph and his sister are the children of an Earl who lost his fortune when a ship that he had financed sunk and all the goods were lost. Joseph tells Caleb that he has an aunt Anne who lives at the end of the river; he must follow the river and make for a large house called Norton Manor where she is a maid to Sir Robert Fairbrother, she will, he says, help Caleb until he returns. Caleb takes the Punch and Judy theatre and heads along the river to find her. When he eventually arrives he is told that she no longer lives there. she has married a fisherman and has moved to a nearby village. He goes in search of her and find her in a tiny cottage at the end of a row of houses. She has a small baby called Dorcas and a step daughter called Letty. Her husband is away at sea and, to make ends meet, they take in sewing from the local crews coming back from long journeys. Letty is not too pleased to see him and Anne is just surprised. The village in general are gob smacked to find a young black man in their midst but seem to take it in their stride. Latent racism is the order of the day here. Questions such as ‘does it rub off’ are common but Caleb is used to that. He cannot find work but is a talented sewer and, while Letty goes out to get the work, Anne and Caleb fall in to a routine of sewing and mending. All seems to be ok.
One morning Letty is ill and Caleb is required to go to the beach to see if any driftwood has washed up for them to burn. He doesn’t find any wood but discovers a body instead. The body is a man and he has a distinctive ring on his finger which Caleb recognises. After this things seem to get more and more mysterious. Caleb and Letty turn detective to try and solve the mystery and eventually put them all at risk. Not only are they poor but Caleb is also black, a distinct disadvantage in the 1750s. I enjoyed this book, I really did. But, and you knew this was coming, I have a couple of issues with it. Firstly, the colour of Caleb’s skin was a little pointless. He wasn’t unusually harassed or picked on, he was a free man and could work and do what he wanted. I wasn’t really sure why he was written as a black man. if he had been used or it had some significance to the story then fair enough, but it wouldn’t have made any difference. That’s not me being racist, it just didn’t sit very comfortably with me. Secondly, there is a romance brewing but it never really gets going. The relationship between Letty and Caleb is nice but not really fleshed out. The book is based on a real life case where a nobleman was paid by the government to transport slaves to the colonies but instead left them on a small island of the coast of Devon and used them as slaves, I remember watching a programme about it. An interesting historical novel that will keep you guessing but, there are too many coincidences to make it really good. 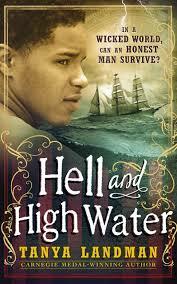 Landman writes well though and her ability to set the scene and make you feel as if you are really there is spot on. you will enjoy if you like historical mysteries, or just enjoy a good yarn! This book is long listed for the Hounslow Teen Read 2017 and is well worth a read. Jessika Keller lives in England after the second world war. Except we didn’t win the war, we won a negotiated peace with the Germans and now live under their rule like the rest of Europe. Jessika lives in a quiet street with her parents and her sister, except her sister is slightly different to her and her father seems to have a very important job that makes everyone scared of him. She also has an older sister who has already started her training and lives away from home. They don’t get on and she only appears briefly in the book. When Jessika is young, new neighbours move in next door and her father encourages her to make friends with the girl who is the same age; her name is Clementine and she is beautiful. As they grow older Clem seems to have different ideas about the way the world works. She isn’t an obedient servant of the Reich and decides not to attend Deutsch Madel meetings anymore, and the two girls begin to lose touch after an awkward incident where Jess tries to kiss Clem. Jess then becomes friends with another girl in the group who she initially didn’t like and they begin a secret relationship. Both are aware that they are strictly forbidden from having a love affair as men and women must do their duty to the Fuhrer and produce children (you get a medal if you have five! that was an actual thing in Nazi Germany) and Jess tries to encourage a boy at the youth group to cover it up. In the meantime things are not going well for Clem and Jess needs to make some harsh decisions. She is an accomplished Ice Skater and trains every day; when the girls reach 18 they go away to finish off their skills (not sure where Jess is supposed to be going – some kind of training camp I think) and she only has a few days to save Clem before she goes. 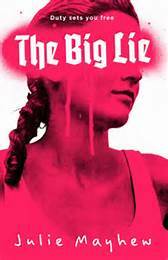 This book is an interesting take on what it may have been like for young people living in Germany between the wars and why so many of them were sucked into the Hitler ideal. The idea that we have a path mapped out for us by the state is pretty scary but, if you are so indoctrinated you may just go along with it like Jess does. She’s not a very strong character and she irritated me, I wanted to shake her sometimes! But, having said that, she is going against everything she has been brought up to believe. The book has a menacing quality about it which, I suppose is what it must have been like then. Who do you trust not to betray you; and Jess suffers the worst betrayal of all. It has some similarities to The Boy in the Striped Pyjamas in that, if you didn’t know a bit of the history some bits might pass you by. I thought that this book had won the Carnegie so I told all the students that it had. Then I saw Sarah Crossan on BBC Breakfast and realised that I had made a serious error! Anyway, IMHO this had the potential to win – I really enjoyed it. Well, enjoyed it is perhaps the wrong word. It made me feel angry and ashamed that white people, not very long ago, could treat black people so badly, all for the sake of the colour of their skin. 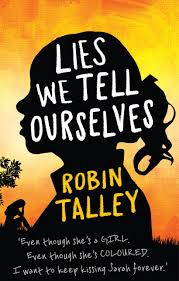 Lies We Tell Ourselves in the story of Sarah – a black 17 year old girl who lives in America in the 1950s. the book begins with Sarah’s first day at a new school. Her parents wanted Sarah and her sister to be one of the first black students in America to go to a white High School. I had to do a bit research here (as ever) and found out that some schools in the Deep South had closed because the Governor of the State didn’t want the schools to be integrated. Eventually, Congress overruled them and the schools had to be opened. Sarah is in a group of nine black students who are attempting to integrate. I have recently read a book about JFK and Martin Luther King and the work that they did to push integration through Congress so it was interesting to see it from a teenagers POV. What came across was that their parents were fighting for this right for their children but the children themselves really struggled. I have never read a book were the hatred comes across so strongly. The first few chapters where the students are just trying to get into the building and then find their classes were amazing. These kids were spat at, racially and physically abused and derided wherever they went. It is a sad time in American History and, I think, goes some way to explain why they are in the situation they are in today. Remember, this was only 60 years ago. The added complication is that Sarah has to work on a school project with two girls who are white. One of them is friendly enough (if a little confused) but the other one is Linda, daughter of the town’s most ardent segregationist. She hates Sarah and Sarah hates her – at first. The book is written from both their view points and is an interesting tale of people being told to think something without actually knowing the reason behind it. Linda’s father sounds horrible and she has been brought up to believe that black people are second class citizens who don’t deserve the same education or rights as white people. Sarah is about to blow that all out of the water. As the girls spend more time together they both get more and more confused. Sarah has feelings about girls that she knows are wrong and Linda, well Linda realises that she is attracted to Sarah in a way she cannot explain. This is not a spoiler as it describes it quite accurately on the front of the book! This book is mesmerising. It is so evocative of the time, and the awful things that black people had to go through just to get the same fair, basic treatment as white people – in their own country. It is another book that should make you feel grateful that you are alive at a time when we have never had more freedom of choice. It should also remind everyone that we have a lot to be thankful for, our battles pale in to insignificance against the wall of hatred and abuse that these kids must have suffered. A powerful book that will make you think. Further reading – Edge of Eternity by Ken Follett – This is a trilogy starting with Fall of Giants. Well worth a read if you have some time as they are big books but they are really informative and easy to read and will give you lot of information about 20th Century history. Also, 11.22.63 by Stephen King. This is the second book that I have read in the Carnegie Shortlist for 2016. Hmmm, what to say about this book? It has been heavily publicised by Waterstones and I was looking forward to reading it. It has a suitably spooky cover and the blurb describes a murder mystery with a little bit of weirdness thrown in in the guise of this strange tree that feeds on lies. The main character is a young girl called Faith who is traveling to the island of Vane with her father, the eminent Reverend Erasmus Sunderly, her mother Myrtle, her brother Howard and her Uncle Miles. Her father seems to be some sort of archaeologist as well as a Reverend and they are travelling to Vane to be involved in a dig, which is being led by a man called Lambent. It soon becomes clear that Uncle Miles has persuaded the Sunderly’s to come to Vane to escape a growing scandal involving the Reverend and a fossil that he had discovered. It’s not really clear what time the book is set in but from the way that the women are treated and the general feel of it, I assume it is set in Victorian England. Women are treated quite badly in this book, as if we have limited intelligence and can’t really understand what’s going on; flirty Myrtle is a little cringey. Faith is very interested in her fathers work but is not allowed to know anything about it; he also seems to be extremely grumpy and is obsessed with a specimen that he has brought with him and then asks Faith to help him hide in a cave. To me, this felt like the most important part of the book but it took ages to get there. The Reverend, as you might guess, comes to a sticky end and Myrtle (the flirty mother) tries to get him buried ASAP so that there is no hint of a suicide rumour (he is found hanging from a tree). There is a big scene at the graveyard and the burial is stopped, so Faith decides the only thing to do is investigate her father’s death, try and figure out what this tree thing is all about and get some revenge at the same time. She pretends that her father is haunting the house and scares the bejesus out of one of the housemaids (who isn’t very nice anyway so that’s ok) and starts studying the tree. She then persuades a boy who takes pictures of dead people (it was a thing in Victorian times…) to help her. It is a well written and well put together book but I found it really difficult to get in to. I didn’t really warm to any of the characters and I wasn’t really bothered if she found who her father’s murderer was because I didn’t really like him. He was horrible to her and had obviously become obsessed with the tree to the point where nothing else mattered; including his reputation, which then a big knock on effect on his family. I was also expecting some romance between Faith and Paul Clay which didn’t really happen. Some great prose though especially descriptive passages – ‘she felt like the murderess of time’ when she stopped the clocks after her father has died, is a great example. It also made me glad that I didn’t live in Victorian times because women had no rights whatsoever and were basically just burden on their family. The Reverend is telling Faith off about sneaking through his papers and tells her ‘all that a daughter can do….. in recompense for the debt she cannot pay, is to hold steadfastly to the path of duty, gratitude and humility. That is the very least a father can expect’ because all women could do was marry to relieve the financial burden on their family. Nice eh? I love a bit of historical fiction (see post on Revolution by Jennifer Donnelly) As the title suggests the book is about the life of Mary Queen of Scots through the eyes of her lady in waiting Ginette – known to all as Jenny. After a brief prologue where we realise that Mary is about to be executed we go back in time to France where the young Mary is to be married to the king of France, Francis. They have a playful relationship which is overshadowed by the King’s mother Catherine de Medici. Jenny accidentally finds herself overhearing a conversation between Catherine and one of her courtiers and decides that she is in a good position to spy on the household to keep Mary safe. There is some romance with another courtier and Jenny, and as Mary is widowed and then travels to Scotland to take up her birth right we follow her. I liked the feel of this book. It was interesting, factual and made the story of Mary really come alive. Mary’s relationship with Darnley, her second husband and then with the Earl of Bothwell who she went on the marry as well, was really interesting. What it’s easy to forget is that during all this Mary was really young. She was married three times, was crowned and gave birth all before she was 25. She then gives up the throne and goes to live in exile in England before Elizabeth realises she is too much of a threat (and she does keep organising plots so…) and has her executed. This is not a spoiler, it’s just history! The thing that the author does well is weave a fictional plot around the historical facts and makes it all seem much more interesting. If anything it just reminds us how lucky we are to be living in the 21st century and not in the age where men gave their daughters away at 6 months to the most available suitor. Breslin also really accentuates the monarchies perception at the time that they were chosen by God and that the crown was their birth right. Mary is portrayed as really regal and loved by the Scottish people and makes as much effort as possible to look after them, like they are her children. In all the stuff written about Henry VIII he has the same kind of mentality; he was chosen by God to lead and no one can change that. Mary is portrayed as a little bit of a schemer but who, essentially wants to continue her family’s right to the crown because she feels it is her duty. She also makes bad life choices by marrying Darnley and Bothwell but, what can you do? If you love history, read this. It really makes it come alive.